What can this tell us about the creative process in the visual arts and other aspects of the human psyche? The last 50 years has seen a veritable explosion in knowledge about the activity of the human brain, especially since the development of functional magnetic resonance imaging (fMRI) has made it possible to study the visual activation of the brain in conscious living subjects. This dissertation looks at the current state of knowledge of the processes of visual perception in the human brain and the neurological basis of artistic creativity using examples of visual art from prehistory to the present day. Since all human activity ultimately arises from the brain this rapidly expanding body of knowledge has profound implications for philosophical, moral and social issues, which are discussed. It was a calm night in winter and a bright moon lit up the frost on the trees and grass below. I surveyed the scene from my vantage point above a broad, dark conifer and could just make out a figure sitting motionless on a concrete step at the edge of the circular lawn. I felt calm and serene cocooned in a blanket of comforting silence. I was content to wait and see what would happen to this motionless person. Would they get up and walk away? I knew it would not have bothered me if they disappeared as I felt safe where I was, quite separate. Neither of us moved for a very long time. Then suddenly I was sitting down on the step wearing my old jacket, blue with cold and shivering violently, “joined up” with “the other one” and terrified, on the edge of emptiness. That was the start of it. The moment I knew I needed professional help and the start of a chain of events that led to me to become an artist. Although “abstraction” and “negative spaces” were not terms I had heard of when I was a child, I remembered spending long hours fascinated by the search for interesting shapes thrown up within the environment around me. Visual puzzles were everywhere but it was not until I studied art and developed an interest in the new neuroscience of art that I realized that these are fundamental aspects of visual perception that the brain uses for lightning quick processing to make sense of the world. A favourite game of looking for faces in everyday objects (visual pareidolia, applying an illusory significance to a visual illusion) is now regarded as one of the early acquisitions of the brains of our ancestors and a central feature of human intelligence (Harth in Goguen, 1999: 106). 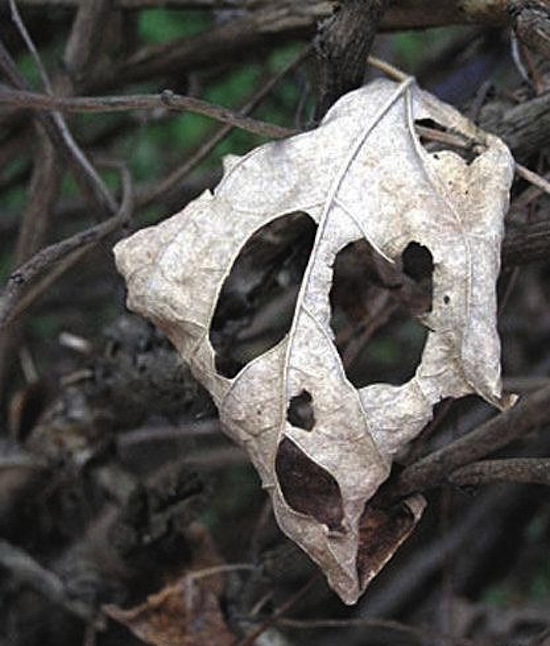 One such example is shown below (figure 2) where a ghost like face is seen in a leaf eaten by insects. When I first began my medical career, knowledge of brain function was limited largely to information gained in cases of specific brain injury linked to anatomical findings at postmortem, compared with “normal” brains. It was thought that visual information from the retina was “seen” in a specialized area of the occipital cortex at the back of the brain, identified as “V1”, as a largely passive process and then interpreted or understood by the surrounding association cortex. Although we are still a long way from understanding the vast complexity of the human brain, stunning recent advances in neuroscience, especially functional magnetic resonance imaging (fMRI), which allows dynamic imaging of the brain in the conscious individual, have revolutionized our knowledge of the visual brain. We now know that about one quarter of the brain is devoted to the visual system and that there are multiple areas of the cerebral cortex each with its own associated specialist visual function, which can act autonomously in processing and perception. The brain is seen as the active generator of the visual image using rapid parallel processing of limited information from the eye. 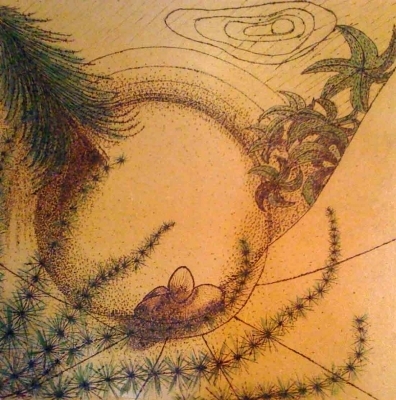 In order to achieve such a feat, in a constantly changing environment, the brain is organized to abstract only features that are essential to make sense of what is in the field of vision, using inherited concepts, such as colour perception and acquired generalizations, or concepts which are modified by experience, such as recognition of objects or specific faces (Zeki, 1999: 1-7). In the future, visual neurobiology will enhance art in much the same way as a knowledge of bones and muscles has for centuries enhanced the ability of artists to portray the human body (Hubel, 2002, foreword to Livingstone, 2002: 8). A number of international academic centres are now collaborating with contemporary artists, exploring the pathways of visual perception, to further define brain function in relation to the creative process. These include University College London and University of Leicester, UK, Université Paris Descartes, France, University of Geneva, Switzerland, University of Oslo, Norway and the Universities of Nevada, California (San Diego and Santa Barbara), Harvard and Stanford in the USA. I began the research that eventually led to this dissertation in the hope that I might gain some understanding of the process of mental disintegration I had experienced. 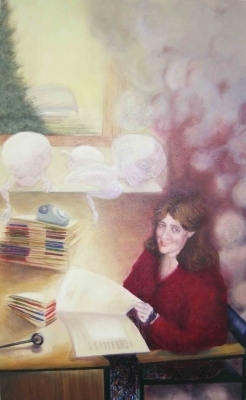 Since my subsequent recovery progressed side by side with my training as an artist, I was fascinated to study how my observations and experiences that took place during this period might influence my creative output in the studio. I wanted to explore current opinion about the creative process and mental illness, especially amongst visual artists. I then expanded my enquiry from the more scientific literature of evolutionary biology, psychiatry and neurology through psychological specialties, archaeology, anthropology, philosophy, art history and historical and contemporary artists. I chose to concentrate on the areas of this research that are most closely linked to personal feelings and thoughts about my own artistic practice, which are inevitably influenced by my background in clinical medicine and interest in brain development and function. In this dissertation I intend to survey key aspects of the recent discoveries in visual perception within the human brain and how these relate to specific examples of historical and contemporary art. My sources are cross-disciplinary, from science (including neuroscience, neurophysiology, neurological medicine, neuropsychology, psychiatry and evolutionary biology), philosophy, art history, literature, historical and contemporary artistic practice, self reflection and personal experience. I have found the publications of a few authors of particular value and have therefore referenced them more often than others. Within the field of neuroscience, I feel I have a particular affinity with the work of Semir Zeki, because of the clarity of his writing and the breadth of his knowledge of many art forms. Although I have not met him or heard him lecture, his writing conveys an immense enthusiasm for his specialism in neuroscience and visual perception and how this can illuminate the creative process that is an integral part of human behaviour. I have also found the work of Patrick Cavanagh, from the field of psychology of visual sciences, particularly helpful and was fortunate to hear him lecture on the subject of the artist as neuroscientist. The other two writers I would highlight are Siri Hustvedt (1955), an American essayist and writer and Darian Leader (1965) a contemporary psychoanalyst with an interest in art. Hustvedt’s ‘verbal wanderings on art’ and the human experience are thought provoking and written with a fluidity and clarity of style that I found much easier to connect with than many art theorists. This may be because she talks in depth about her personal experience of viewing the painting not just on one occasion, but over repeated viewings over her lifetime. Darian Leader has written extensively on psychoanalytical theory, philosophy and the relationship between creativity and mental illness. I found his approach and style gave me a basic understanding of some of the more difficult aspects of philosophy and psychoanalysis which other authors could not. Inevitably I have had to be selective, given the breadth of this subject, and I have chosen to concentrate on two key areas, abstraction and ambiguity, where I see a clear link between brain function and the creation of visual imagery, through my own artistic practice. The first chapter establishes the concept of the artist as the first neuroscientist. There follows a summary of some key aspects of the anatomy and function of the visual system, which underpin the discussion of the rapidly developing field of neuroaesthetics. The main investigative techniques that are being used to study the visual system are briefly described. Chapter two focuses on the process of abstraction that I consider to be a fundamental function of the visual brain. I discuss this from a neurological point of view and highlight parallels with the artistic practice of the Dutch artist Piet Mondrian (1872-1944) who sought to uncover the fundamentals of visual perception both in a direct and a spiritual sense through the critical analysis of his creative output as a painter. Chapter three is an investigation of the link between various forms and levels of ambiguity in visual imagery and the generation of an emotional response in the viewer and how this impacts on our memory. The final chapter, chapter four, starts by considering the philosophical concepts of “the unfinished” and “the ideal” in the context of visual art and their place within the creative process. The wealth of knowledge now being gained about functional processes in the visual cortex is probably applicable to cortical activity elsewhere in the brain, and therefore all cognition. Inevitably, our analysis and theories of philosophy, mental illness and psychoanalysis since humans began creating a written record have taken place without the benefit of knowledge of the workings of the brain. Since the brain is the ultimate source of these deliberations and the organ with which we try to understand the world around us, the rapid advances in neuroscience should give new and exciting insights into human behaviour and some of these will be discussed in the concluding part of this final chapter. For the full dissertation and biblography please click here.